Little Known Fact: Cancun is Freaking Hot in August! Ok, ok, I know this is probably going to sound like a “well duh” moment, but I’ll go ahead and put it out there. When we went down to Cancun, Mexico just a short time ago for what’s become an annual beach trip, it was unbelievably hot! I mean sweating-just-sitting-outside-not-moving-hot. Shocker, right? Maybe not, but even so, don’t miss my Cancun blogs: there are boats, beaches, sunburns galore and (as always) enough tequila to fuel a college spring break. In what’s become a yearly pilgrimage to Cancun, Mexico, my boyfriend Sean and I found ourselves on a plane on a hot Thursday morning in August headed for the beautiful Mexican beaches just over two hours from Atlanta. This year we flew down to Cancun with our friends Adam and Soo on the same flight, and when we arrived and made it out of the Cancun Airport, Adam’s good friend Lidia was there to pick us up. After a quick drive from the airport to the hotel, the Westin Lagunamar (just as last time) checked us in and we met the rest of the group. Jim and Dirk had both come last year and Heather and her husband Nick were joining us for the first time. 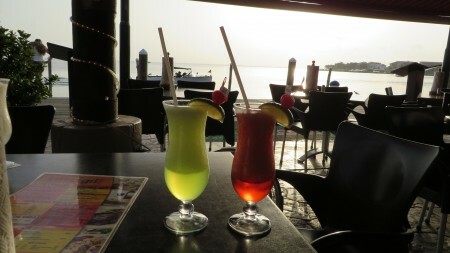 For the newly arrived four of us, we were famished (it was already 4 PM in Cancun) and we headed across the street to the upscale La Isla shopping plaza bordering the lagoon. 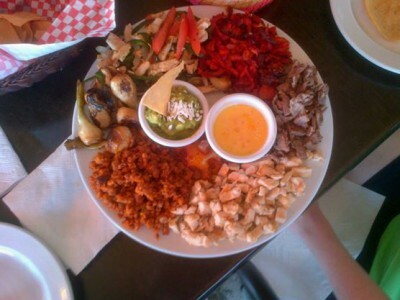 After sitting down at the first restaurant we came upon, Taco Grill (and ordering fruity drinks), Sean and I decided to split a “mixed grill for two” platter – a snack to hold us over until dinner much later that evening. When the grill for two arrived, it looked more appropriately portioned for all six of us at the table. Grill for two, my eye! This was more like a grill for four or five at least! Very tasty though, just way too much food! Image courtesy of: Adam Jones-Kelley. And with this omen of Cancun’s idea of tourist-sized portions it was needless to say, the vacation was off to a good start… It was also around this time I realized it felt much hotter outside than the last two times I’d been south of the border… I mean, I was sweating at our outdoor table, next to the lagoon, with a fan blowing directly on me, sitting still. And yet sweating. Oh boy, this was gonna be one helluva trip. 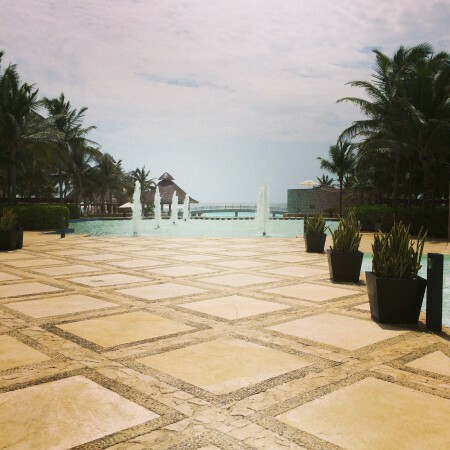 Luckily, I wasn’t alone in my observation that Cancun this August was oppressively hot. Once we’d all eaten (Sean and I to the point of being stuffed), everyone returned back to the hotel to relax (and digest) before dinner, at which point we were supposed to go to the bull ring in town and meet our other friends Jeremy and Lucia for dinner. Although we could have gone to the pool then, Sean and I both agreed it was even too hot for that. Instead we ended up flopping in the air-conditioned room for the rest of the afternoon until the sun went down. Oh well, the view of the pool and the beach from our room was excellent, at least. This is the view from the main lobby of the Westin. About a half hour before we were all due to leave for dinner (by this time it was evident neither Sean nor I was hungry, but we’d go anyway to hang out), he and I went to see the Westin’s grounds and take some night pictures. When everyone convened, it became clear that only half of us were hungry and all of us were tired from traveling, so we bailed on leaving the hotel, had a bite at the restaurant on the premises, The Dunes, and called it a night. Friday, our first full-day in Cancun was another hot one (see a pattern yet?). 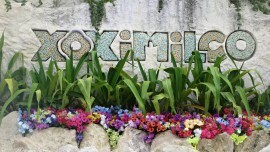 Luckily, the only plan that day was to lounge poolside and then Lidia had arranged for an entertaining dinner cruise that evening at a place called Xoximilco, south of Cancun. Sean and I took full advantage of the Westin’s sumptuous buffet breakfast (we ended up doing this every morning we were there), and while we were leisurely eating on the patio, the majority of the rest of the group trickled in before heading to the pool. We joined them after eating our fill of chorizo omelets and coconut pancakes, swimming in the Westin’s infinity pool and getting buffeted by the rough ocean waves (the ocean was pretty choppy the whole time we were there). By mid-afternoon the sun had just gotten too hot, even under an umbrella, and we retreated indoors. After a late return to the pool, everyone disbanded to get cleaned up for Xoximilco that night: the cruise began at 7:30 sharp. Our chariots for the night. Let me say this up front: the Xoximilco website is not very informative of what to expect. It neglected to mention the bugs, the total trip time for this dinner cruise (over three hours) or anything about separating boats by age groups. None of this was a problem for my boisterous group of 12, however, the unfortunate family with two pre-teen girls seated right next to us on the boat, I’m sure, felt differently. We certainly didn’t go out of our way to make them uncomfortable or unwelcome, but since the cruise was an all-you-can-drink-type, the tequila shots (and consequently uninhibited conversations) flowed freely. 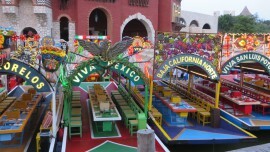 During the cruise, we were taken around a large lagoon featuring sights along the way of historical places in Mexico, and periodically sampling traditional Mexican dishes like guacamole, fried crickets (no kidding! ), ceviche, queso cheese, chicken mole and pork verde, etc. It was all delicious and all served to our boat from other boats stationed along the tour route. The whole setup was really impressive in its execution – logistically speaking. About halfway through the evening, the boat docked so everyone could take a bathroom break and at this point, the many tequila shots earlier were starting to set in. Rather than ride the tour to completion, the group decided to leave a little early and head back to the hotel. I can say without a doubt, no one must have been more thrilled to see us leaving than the family seated next to us. Sorry, guys. 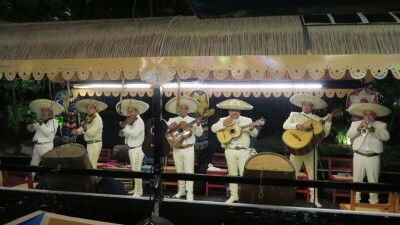 One of the bands playing on a boat during our dinner cruise. Sean and I had a short stroll along the beach when we returned looking for sea turtles like the year prior, but no such luck that time. 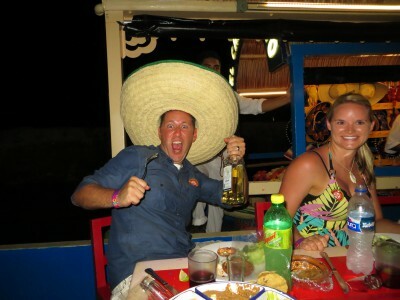 And this was just our first days in Cancun! Stay tuned for tales of yachts, break dancing old men and an infamous fellow named Gary the Gecko! This entry was posted in Mexico, North America and tagged Boat, Cancun, Hot, Mexico, North America, Pool, Sea turtle, Tequila, Travels, Westin, Westin Lagunamar, Xoximilco on September 7, 2014 by Paige N..